(2:05 p.m. EST) -- Viking Sea sailed into the Port of St. Maarten this morning, marking the end of a 13-week cruise ship dry spell as the Dutch-Caribbean destination recovered from damage sustained during Hurricane Irma, which hit in September. 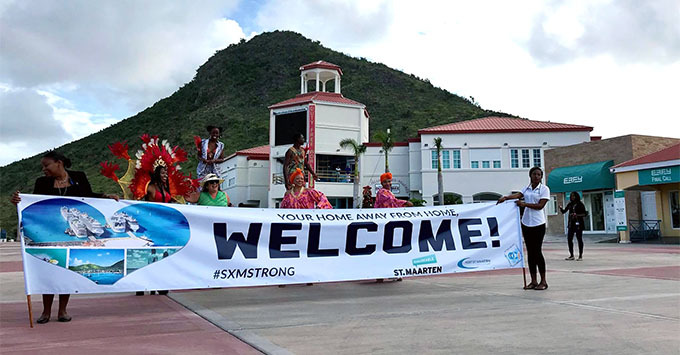 The milestone was marked with fanfare, with a welcome banner, appearances from a steel drum band, stilt walkers, Carnival queens, and dancers, while ministry and port officials greeted the vessel as it sailed in and passengers disembarked. Complimentary #SXMSTRONG wristbands were passed out to visiting cruisers in a show of support and solidarity. A plaque exchange also marked the occasion, a crucial one toward economic recovery for St. Maarten, in a private ceremony onboard. Cruise Critic member Raleighcats, who was onboard Viking Sea and in St. Maarten today, told us, "We found the people very warm and welcoming. Everyone we interacted with thanked us for coming. While signs of the hurricane’s impact are everywhere, the island is still beautiful and recovery is proceeding -- more and more shops and restaurants are open. We’re glad Viking stopped here." British line Marella Cruises (formerly Thomson Cruises) is scheduled to arrive in St. Maarten with its ship Marella Discovery tomorrow, on December 5. Royal Caribbean's Grandeur of the Seas is set to call on St. Maarten on December 17. Similar portside activities (live music and performers in addition to wristbands and an official welcome) are being arranged by the Port of St. Maarten for both calls. St. Maarten, a stalwart of Caribbean cruising, is the most recent in a string of Eastern Caribbean cruise ports to reopen to ship calls. St. Thomas welcomed passengers on November 10 and San Juan reopened as a port of call on November 30. Tortola, a cruise port in the British Virgin Islands, is slated to reopen to Marella Cruises on Wednesday, December 6.